The appeal of Transformers is clear: they're more than meets the eye! Everybody loves value, so getting two toys in one is great - you could either play with something that kinda looks like a robot or something that kinda looks like a car. Sweeeeeeeet! What could be better? Something that kinda looks like a robot or a car or a different, larger robot! Woo! The late Robots in Disguise line of toys gave us two excellent combiners: the train-based Rail Racer and construction-bot Landfill. 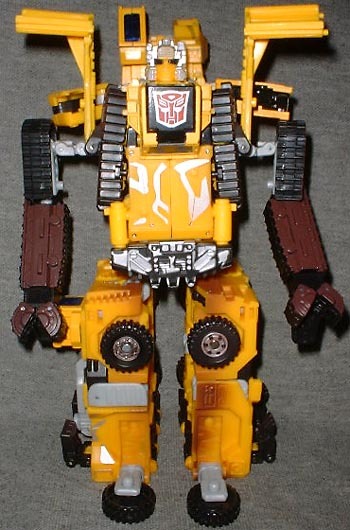 Well, okay, admittedly, Landfill had a slight problem: the robots who formed him had wildly disparate color schemes, so the big guy never looked like he really fit together. Blugh. 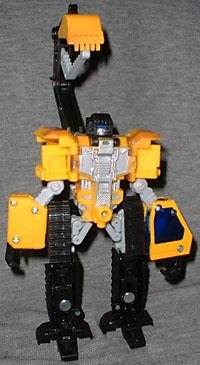 Still, he was pretty cool, and now there's a Build Team box set with repainted robots: all four are yellow and black, like real construction equipment. 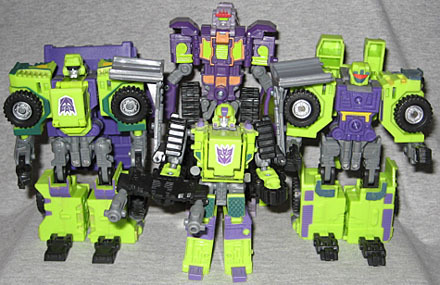 The first Transformers combiner, Devastator, was another set of construction vehicles that joined together. There were six of them, which made them a rarity - afterwards, all the rest of the gestalts formed from five, with one big 'boss' as the head and torso. 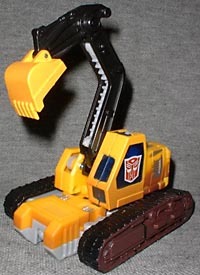 Landfill, oddly, is made from only four robots: bulldozer Wedge, backhoe Grimlock, dumptruck Heavy Load and crane Hightower. 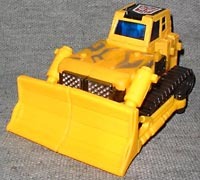 The other construction Autobots look to Wedge as their leader, even though he's still young. He's a natural leader in the making with his take-charge attitude and revved-up energy. He can be reckless and make mistakes but will never jeopardize his friends, and is always there to help them. He bulldozes into battle with double beam guns. As usual, the head/torso unit is the leader. What's odd about Wedge is that he's also the smallest of the set. 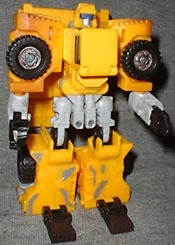 In vehicle form, all four Build Bots are about the same size, but little robo-Wedge's head is only 4 1/4" from his feet. He's got two big blades on his shoulders that stand an inch taller, but those hardly count. 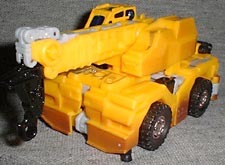 Wedge's transformation is classically simple: the treads become his arms, while his legs fold out of the engine. It seems like his head should come out of the 'dozer's cab, but it doesn't. In robot form, Wedge moves at the neck, shoulders, elbows, hips and knees and carries double beam guns. A seasoned warrior, Grimlock is second in command of the construction Autobots. He looks very harsh but is really calm and upbeat. He works closely with the Construction Team leader to pass on the tactics and experience he has gained in his many battles. He can be counted on to assess every situation and come up with a good plan of action. Okay, so this trend of reusing old Transformer names is nice, when it makes sense. Skywarp, for instance. Grimlock, in this case? Not so much. Last time we had a Grimlock, he was a T-Rex. Now a backhoe. Seems like a downgrade, to me. A backhoe would be more like Sludge, the brontosaurus, wouldn't it? The long neck, and all? It's like they drew a random, popular name out of a hat. Pseudo-Grimlock stands 5 3/4" tall, and his shovel can be mounted on his shoulder as a large serrated claw. Grimlock's transformation is the most complex in this set: a whole lot of spinning and pulling and folding and other suggestive verbs. His robot form seems to borrow a lot from the Constructicons' Scavenger, and he moves at the neck, shoulders, hips and knees. He's got weird double elbows, and his wrists move, too, but it's unclear whether those are intended to be articulation for the robot. When Heavy Load bellows, "Let's haul, Autobots!" he means HAUL! He's the most powerful of the construction Autobots and has an incredibly thick armor, making him a terrifying sight for any Decepticon unlucky enough to get in his path. He is a martial arts master and moves with graceful strength despite his bulky size. Big and bulky, they're not kidding. Heavy Load may be 5" tall, but he's also 3 1/2" wide. He's got kind of a dopey grin on his face, and the truck's front wheels make his arms look friggin' huge. The bed of the truck can turn into a humongous claw that's far too heavy for him to hold, or it can hang off his back. Heavy Load has an easy transformation, which will just get easier with time since you'll do it twice as often. More on that later. 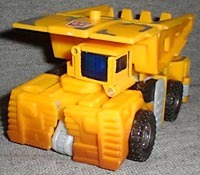 His head folds out of the cab, his arms are tucked into his sides and his legs, for the first time in a Transformer dumptruck, don't fold out of the truck bed. Hightower is an excellent marksman, storming into battle with a cannon in one fist and a magnum in the other. He likes to make things hot for Megatron with fire weapons and flame throwers. He is very alert to dangerous situations and often guards the Construction Team leader, as well as providing the solid support and advice of a seasoned warrior. Hightower's crane form is a bit short and squat, and the hook doesn't work right, but there's one cool little feature: two pillars fold out from under the front bumper, just like the supports on a real crane. For that bit of detail, I'll forgive a lot. Still, if he wasn't part of a combiner, Hightower would probably still be on shelves. His crane turns into a giant blaster, and he's got a pistol stored in the cab. In the world of Transformers lore, Hightower and Heavy Load would probably be brothers - they transform the same way, as hinted above. Sure, there are a few minor differences, but nothing major. Hightower moves at the neck, shoulders, elbows, wrists, hips, knees and ankles. So that's it for the individual robots. 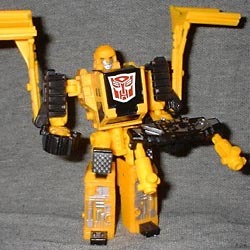 You already know that Landfill is unique in the realm of combiners for only having four robots, and for having a smaller head/torso unit. Now, both of those make him stand out, but that's not where the insanity stops. Usually, for these big gestalts, everyone's got an assigned position: Robot X is a leg, Robot Y is an arm, all that. Not Landfill! The cool thing about Landfill is that he can actually be formed three different ways. This giant robot is a combination of the four Build Team members. 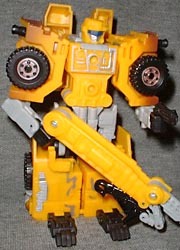 With his Tornado Fusion System, he has three modes that switch around his limbs while Wedge remains steady at the center. Hurricane Mode is a superb multi-purpose type formation, balancing offense and defense. Cyclone Mode is a power type mode, excelling in close-quarters combat. And Typhoon Mode is his battle type formation, with the highest offensive power. This invincible Combiner robot is born of his components' four good, nature-loving hearts. That's right, Wedge is always the head, but the others can swap around easily. The three limbs join together via a clever series of dovetail joints to become whatever you like. The modes, one can assume, are named after whichever robot is acting as the arms, and each has its own selection of weapons. Hurricane Mode has Grimlock up top, Cyclone Mode has Hightower and Typhoon Mode gets Heavy Load. Turning the vehicles into legs is easy, but the arms are more difficult. This is one area where the god-awful rainbow robots work out nicely, since the swirling colors make each form look unique. Now that the Build Team has been repainted, they look much better than the originals. The only way they could have been cooler was if they'd been turned green and purple, like all good construction vehicles should be. And eventually, they were. In order to get more Transformers product on shelves without spending much money on development, Hasbro came up with Transformers: Universe, a vaguely defined and very strange toyline. Basically, Universe was just a big umbrella under which Hasbro offered all their repaints, making it the first time that a complete toyline was built entirely of store exclusives. Weird. The first "official" Universe toys showed up in 2003, and the last few came out in 2006, so it's a long-running effort, too. Target had the Landfill repaints - Construction Devastator - available in two two-packs: Longhaul and Hightower, and Bonecrusher and Scavenger. Other than the colors, they are precisely the same as the previous multi-colored releases and the Wal*Mart exclusive yellow version. None of them had individual tech specs or bios, so you can make them whatever you want them to be. If their personalities are the same as the G1 versions, then Longhaul hates his job, Scavenger is a pathetic tag-along, Bonecrusher loves to destroy things and Hightower... didn't exist? If he's a new version of Hook, then he's an uptight perfectionist. Transformers Combiners have always been cool, from the very first to the very latest. Well, maybe not the latest; that's the lame Energon Optimus Prime. Still, the gestalts are generally fun, and Landfill is uniquely inspired. Do you own three of any Transformer? Tell us on our message board, the Loafing Lounge.